The Auslan Picture Dictionary MIX N MATCH CARDS e-book is a PDF and includes all the signs and pictures from The Auslan Picture Dictionary e-book with their English labels, in ready-made card template. All you need to do is to download this e-book, print out the sheets, cut and laminate the cards. It is excellent for deaf students to help them acquire common English words in early grades. 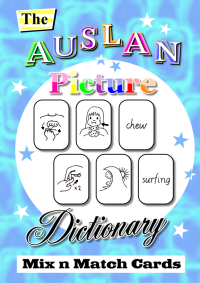 The Auslan Picture Dictionary MIX N MATCH CARDS e-book is copyright and for personal and school classroom use only. The e-book is to be printed only once its entirety per individual/teacher and the individual/teacher may photocopy the e-book as many times for personal and classroom use. Please do not photocopy or reprint the e-book to be distributed to other individuals or teachers, please direct them to this website instead.